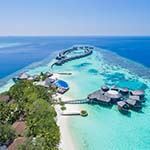 Kuredu Island Resort is situated on the spectacular northern reef of Lhaviyani Atoll, with three types of accommodation - luxury bungalows that line the white sandy beach, luxury water villas over the lagoon and luxury Sulthan pool villas in the centre of the island. Kuredu is a large island, offering the first golf course in the Maldives and many restaurants, bars, shops and other activities. Scuba diving is spectacular. Meeru Island Resort & Spa is a tropical paradise of palm trees, white sandy beaches and turquoise waters situated in the North Mahe Atol. It is reached by a 55-minute speedboat transfer from the airport. 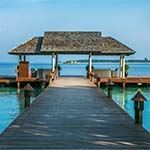 The resort is surrounded by a beautiful lagoon and is the only hotel on the island. Garden rooms each have a private porch, air conditioning, ceiling fan, cable TV, safe, minibar, free WiFi and tea/coffee facilities. 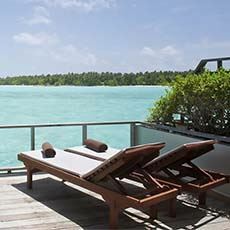 Beach Villas have beautiful views of the lagoon and Water Villas are located at the waters edge. There are several restaurants and swimming pools, as well as a spa. You can take a boat to snorkel off the home reef or scuba dive in the crystal clear waters. 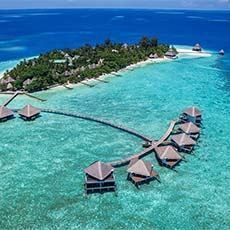 Adaaran Club Rannalhi offers relaxing beach and water bungalows on the South Male Atoll in the spectacular Maldives. 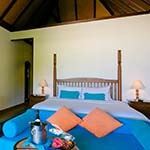 Located 45-minute by speed boat from Malé International Airport and surrounded by clear blue waters and white sands, each air-conditioned bungalow has classic wood furnishings, TV, seating area, safe and private balcony. 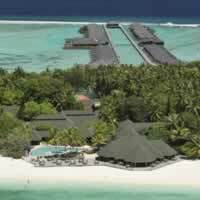 Other facilities on the atoll include water sports, a spa, two bars and four dining options. 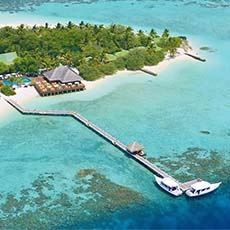 Embudu is a small island situated about 45 minutes from Hulule in the magnificent Maldives. The resort offers comfortable rooms, wonderful beaches and a good restaurant. Each guest room has a mini fridge, tea/coffee maker, hair dryer and safe. The water bungalows also have satellite TV. There is a certified diving school and you and have beauty treatments at the Serena Spa. Eriyadu Island Resort is a charming, tropical retreat, situated in North Male Atoll in the Kaafu Atoll Region, set on a private sandy beach by the ocean, with a stunning lagoon and house reef, perfect for scuba diving. 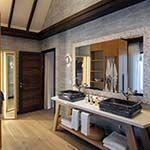 The spacious, en-suite guest rooms have elegant, modern decor with Maldivian touches and feature king-size bed, bathroom with shower, seating and private veranda / balcony, all with excellent views of the beach and turquoise ocean beyond. 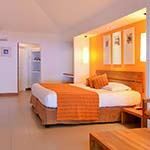 Air-conditioning, hairdryer, satellite TV, mini-bar, Wi-Fi , safe, coffee / tea making facilities and ceiling fan are provided. 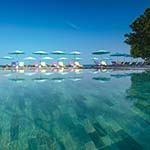 Take a dip in the outdoor swimming pool and enjoy the beach bar / cafe, spa, gym and restaurant, serving delicious local cuisine and seafood dishes. 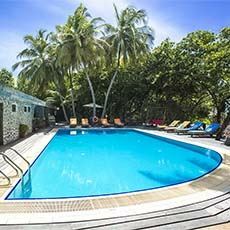 Thulhagiri Island Resort & Spa is a modern, stylish resort, situated on a small island surrounded by turquoise lagoons, in North Male Atoll, just 20 minutes by speedboat from the airport. 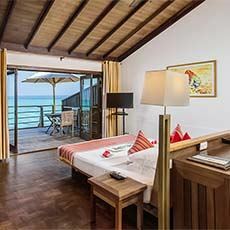 The beach and water bungalows are bright and spacious, each featuring thatched roof, contemporary rustic décor, wood and bamboo furniture, king-size bed, large bathroom with bathtub, twin basins, private open air shower, seating and veranda or deck with sun-loungers and sea views. Air-conditioning, satellite TV, Wi-Fi on request, mini-bar, hairdryer, complimentary toiletries and tea / coffee making facilities are provided. Enjoy the private beach, main lounge, outdoor swimming pool, spa, main decks and bars. Dine in the open-sided restaurant serving Asian, Austrian and American cuisine. 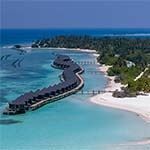 Adaaran Hudhuranfushi is a relaxed tropical island resort set in lush gardens and fringed by spectacular beaches and the warm turquoise waters of the sparkling Indian Ocean. 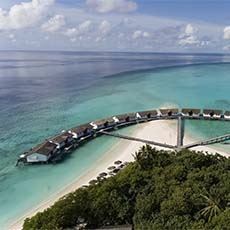 Accommodation ranges from beautiful Beach Villas on the sand, to luxurious Ocean Villas with direct access to the water. 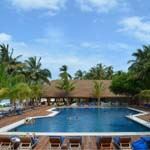 There is a choice of restaurants and bars, as well as a swimming pool and spa for relaxation. There is a fitness centre and many watersport facilities for those seeking a more active holiday, as well as WiFi. 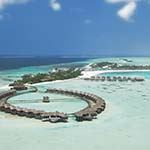 OBLU by Atmosphere is a luxury spa resort situated on Helengeli Island in the North Male Atoll. 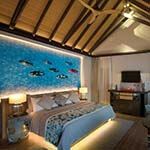 Situated 50-minutes from Male international airport by speedboat, this lodge offers luxurious accommodation and an outstanding house reef, with resident giant sea turtles, lobsters and silver-tipped sharks. 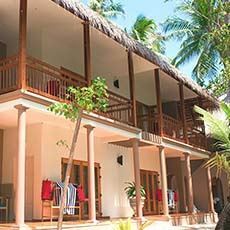 Villas have everything you would expect, including outdoor veranda with daybed and open air bathroom. 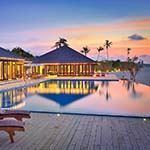 Deluxe beach villas have direct beach access and Lagoon villas have plunge pools. 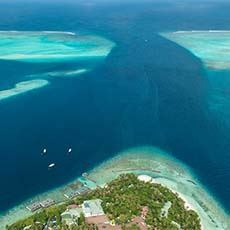 Activities include a PADI dive centre offering channel and reef diving, snorkelling and many water sports. Afterwards relax at the Elena Spa before enjoying cocktails at the restaurant or bar. Olhuveli Beach is a luxury resort situated at the tip of South Male Atoll, with its wonderful turquoise waters and white sandy beaches. 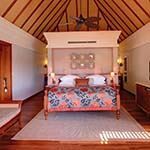 The spacious air-conditioned rooms are elegantly decorated and open out onto a private veranda looking out to the Indian Ocean. 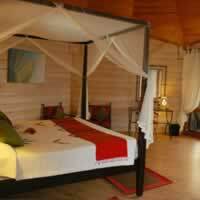 Each is en-suite and furnished with king-size beds. Satellite TV, free Wi-Fi, complimentary toiletries and tea / coffee making facilities are provided. Enjoy the gym or a spa treatment and dine at a choice of restaurants that serve delicious fresh seafood, Asian and international cuisine. 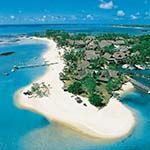 Paradise Island Resort & Spa offers private villas and bungalows on an island in the Indian Ocean. The resort features an outdoor pool, 4 restaurants and a spa. 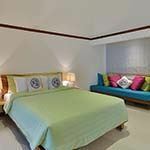 Guest rooms come with air conditioning, tiled flooring and a private terrace with ocean views. Amenities include satellite TV, a safe and a refrigerator. A tea/coffee maker is provided. The resort features a fitness centre and tennis courts. 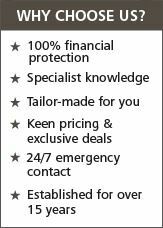 Snorkelling and diving equipment is available. 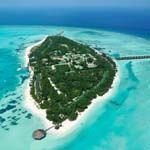 Reethi Beach Resort is situated on a tiny island in Baa Atoll, a scenic 35-minute flight from Male international airport. 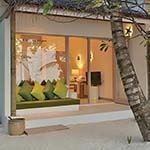 The elegant and spacious villas are built from natural materials in typical Maldivian style. 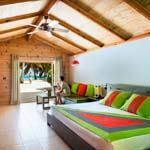 All air-conditioned rooms have TV and are set among tropical foliage along a long expanse of powdery soft beach or on stilts over the clear blue lagoon. There are five restaurants and bars, poolside and beachfront. 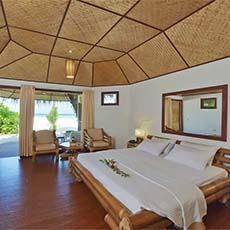 Facilities include a PADI dive centre; a spa and wellness retreat and water sports centre. Excursions allow you to explore the beauty of Baa Atoll and the rich culture of its inhabitants. 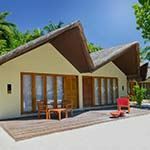 Sun Island is a luxury tropical resort & spa hotel situated on picturesque Nalaguraidhoo Island, in the South Ari Atoll. Walk down the wooden jetty from the white sandy beach to your spacious water bungalow, set on stilts above a tranquil turquoise lagoon. 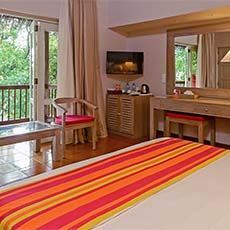 Each bungalow features a king-size bed, wooden flooring, seating area and en-suite bathroom with bathtub and shower. The private sundeck has a staircase leading down into the water below. 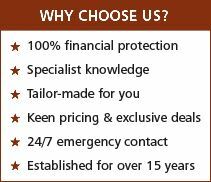 Air-conditioning, ceiling fan, safe, mini-bar, hairdryer and tea/coffee making facilities are provided. 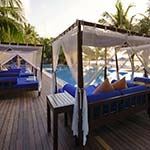 Other facilities include an Ayurvedic Spa, swimming pool, bar and several dining options - including Thai, Italian and fresh seafood. 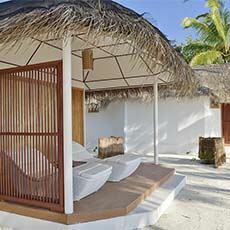 Constance Moofushi is a barefoot chic retreat situated on the spectacular South Ari Atol in the Maldives. 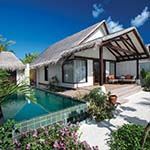 Luxury beach villas are set on dazzling white sands, whilst water villas are built on stilts above the turquoise waters of the lagoon. 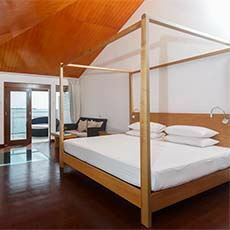 Each spacious villa is fully equipped with all modern amenities including ipod docks, minibar and wooden terrace. Two restaurants and bars offer a choice of fresh seafood and fine international cuisine, as well as a relaxed beach grill. 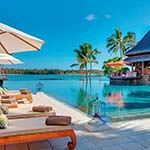 With some of the best diving sites in the world, this secluded island offers a truly specatacular setting for snorkelling, swimming, deep sea fishing and bio-marine spa treatments. 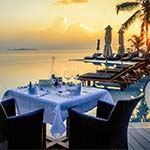 Kurumba Maldives is a luxury boutique retreat situated on a private tropical island in the North Male Atoll, with beautiful white sandy beaches and coconut trees. 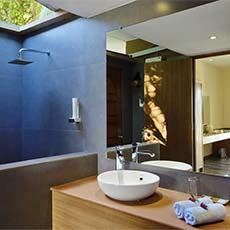 The air-conditioned en-suite guest rooms feature comfortable beds, bathtub and indoor and outdoor showers, all opening out onto a private terrace or courtyard. Satellite TV, free Wi-Fi, safe, bathrobes, slippers, mini-bar, complimentary aromatherapy toiletries and tea / coffee making facilities are provided. You can relax in the spa, take yoga classes, enjoy the swimming pool and a choice of dining options at the hotel or on the beach. 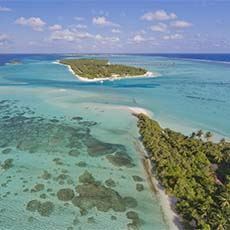 Lily Beach Resort is set on the small island of South Ari Atoll, just 25 minutes from the airport. 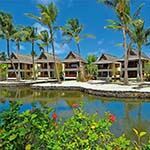 Stilted Lagoon and Water Villas are surrounded by sea and Beach Villas are nestled amidst lush plantation, just steps away from the beach and ocean. 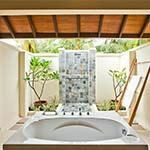 The air-conditioned villas are spacious and feature wooden floors, private outdoor bathroom with jacuzzi bath and shower, king-size bed and private decked terrace. Satellite TV, free Wi-Fi, coffee / tea making facilities, safe, mini-bar and slippers are provided. 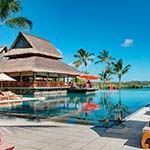 The resort has 2 swimming pools, 3 bars, an over-water spa, gym and snorkelling facilities to explore its own coral reef. There's a choice of 4 restaurants with panoramic lagoon views, serving Asian and International cuisine.